If you aren’t familiar with the name, that might sound a little alarming, but no worries, it’s the name for a wonderful and delicious pancake—sort of. A good comparison might be a cross between an omelet or crepe and a pancake. It is actually very similar to a German pancake. Whatever you call it, it is a wonderful hot breakfast that is fun and delicious. It’s pretty enough to serve company. 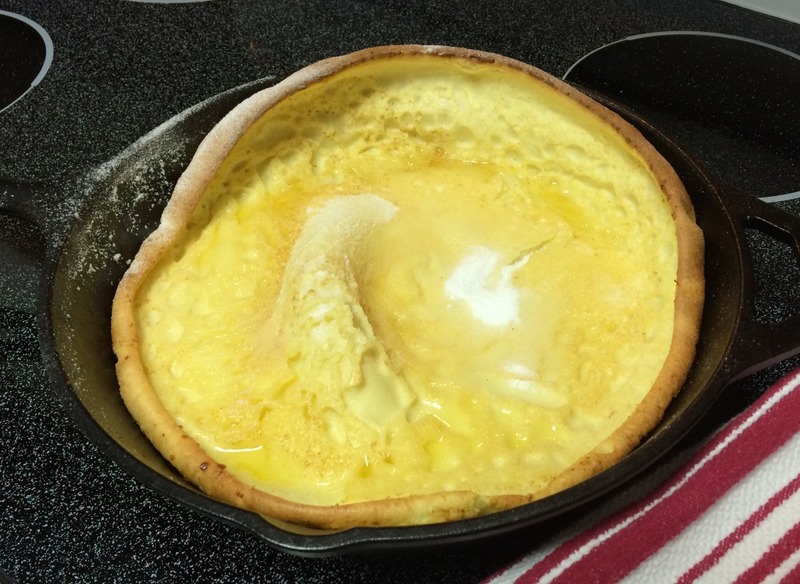 Not long ago I decided to see how similar a Dutch baby was to a German Pancake. They are very similar. The both bubble up and rise in a unique style that makes them look very appetizing and intriguing. In my taste test I found the German pancake tasted a bit more omelet like that the Dutch version. Both are very good, so it depends on what you prefer. The Dutch Baby is actually considered a form of German pancake. But at the time I didn’t know that. Who knew there would be so much to learn about pancakes! The Dutch Baby version was introduced in a Seattle restaurant in sometime before 1950. Apparently it was served as 3 smaller popover style pancakes at first, which is why they were called ‘babies.” The combined larger version later became more popular and kept the name. Another recommendation was to use a cast iron skillet. I didn’t have one at the time of the test. Using corningware, the pancake did rise, but not like an official Dutch pancake. Since then I received my new favorite cast iron pan. Naturally I had to try it again. Much more fun! As you can see in the photos, in the cast iron pan it rises much better. Part of the secret is to keep the pan hot. Once you melt the butter in the bottom of the pan, it’s suggested you keep it in the hot oven until ready to pour the batter in. It’s really a taste surprise. Serve immediately. Sprinkle it with powdered sugar, offer syrup, a special jam, or fresh fruit as a topping, though it’s yummy with powdered sugar. Its presentation is one your whole family will enjoy. Melt 2 TBS butter in a medium cast iron skillet then remove from heat. In a blender mix eggs, milk, flour, salt, vanilla, and the sugar until smooth and foamy, about one minute . Bake until pancake is puffed and light brown, about 20 minutes. Serve immediately. Pancake may fall quickly. Here is the essential cast iron pan. I received mine as a Christmas gift this past year. It is wonderful. Maybe it is my imagination, but it feels a little lighter than some heavier cast iron pans. That makes it easier to handle when cooking. So many things supposedly cook better in a pan like this, so it is going to be fun to experiment with it. I’d suggest this 10 inch size. It worked perfect for Dutch Babies. Toppings Galore – You can try these for a topping or combine several!